As customers know that our main product is tire scrap recycling to oil pyrolysis plant. And since 2011, we DOING Company made a successful transition from domestic market to international business. After 6 years effort, we have installed our tire scrap recycling to oil pyrolysis plant in about 35 countries. 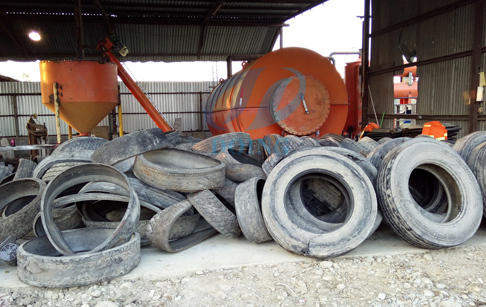 At first, tire scrap recycling to oil pyrolysis plant is mainly required in some Asia and Africa countries. Due to the strict regulations in American and European countries, it’s not easy to develop the market there. But right now, our main market is not only Asia and Africa countries any more, we’re getting more and more market share in American and European countries. By now, we have installed our tire scrap recycling to oil pyrolysis plant in 16 American and European countries. Only in Mexico, we have more than 20 machines there. On February 9th, 2017, we just finished the installation and commissioning of the 22th new tire scrap recycling to oil pyrolysis plant in Allende, Mexico. 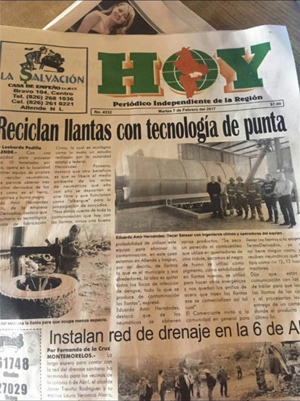 After the waste tire pyrolysis plant become more and more popular in Mexico, this business got the attention of the local media. 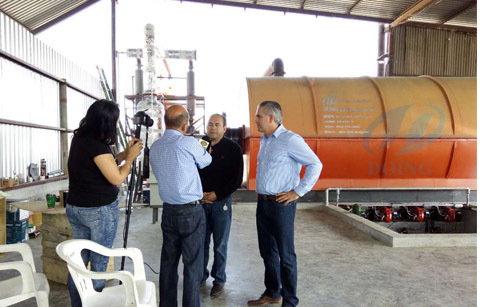 Just after our tire scrap recycling to oil pyrolysis plant finished installation in Allende and put into production, it was visited by the local media in the first time, and interviewed our customer. This news was reported in the local newspaper immediately. We believe that this waste tire pyrolysis business would become more and more popular after this report.